An excellent speedy supper. You can top with any leftover seeds rather than buying a ready-mixed pack. 1. Put the sweet potato in a large pan and cover with cold, salted water. Bring to the boil and simmer for 5 minutes. Add the chick peas and boil for a further 5-7 minutes or until everything is soft and tender. Drain and leave to steam dry for 3 minutes, before roughly mashing with a fork. a bowl, then whisk in the oil, lemon zest and juice, harissa and most of the mint leaves; season. 3. 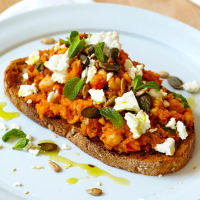 Mix the dressing through the warm sweet potato and chick peas, then pile onto the toast. Crumble the cheese over the top and scatter with the seeds and remaining mint, plus a drizzle more oil, if liked.